This handcrafted and hand carved wooden stool has been created by skilled artisans who have a love for their craft and it is so evident by the great detail they have bestowed on this stool. Along with the wonderful detailing of a fish, it was then stained in a whitewash finish that is beautiful and inviting to any home décor. It is a sturdy and handy stool and great for adults and children as well. Makes a great piece for taking outdoors for watching the sunset by the beach or it can be used as a plant stand as well. Size is 10 inches tall x 10-1/2 inches wide and 10 inches deep. 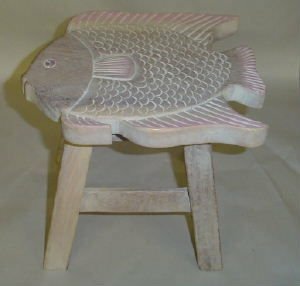 Also available in a whitewashed finish: Fish Hand Carved Wooden Foot Stool in Dark Stain Finish.